Everybody knows Jeb Bush’s “shock-and-awe” strategy for intimidating other potential candidates right out of the race with his massive early super-pac fund-raising numbers hasn’t exactly worked out. But at least, most observers thought, Jeb’s incredibly deep pockets would keep him viable until deep into the nominating contest. New numbers for paid ad spending by Republican candidates from NBC News’ ad monitoring partner SMG Delta show that when Jeb fully cuts the purse strings he may just be throwing good money after bad. His super-pac buddies have already spent $28 million — nearly triple the total spent by any other candidate (and allies) in either party, mostly on positive ads about Jeb’s record in Florida. For his trouble he’s mired in a poor fifth place in the RealClearPolitics average of recent national polls at 5 percent of the GOP vote, and is actually in sixth place (albeit with a booming 7 percent) in the state where he’s invested the most time and money, New Hampshire. 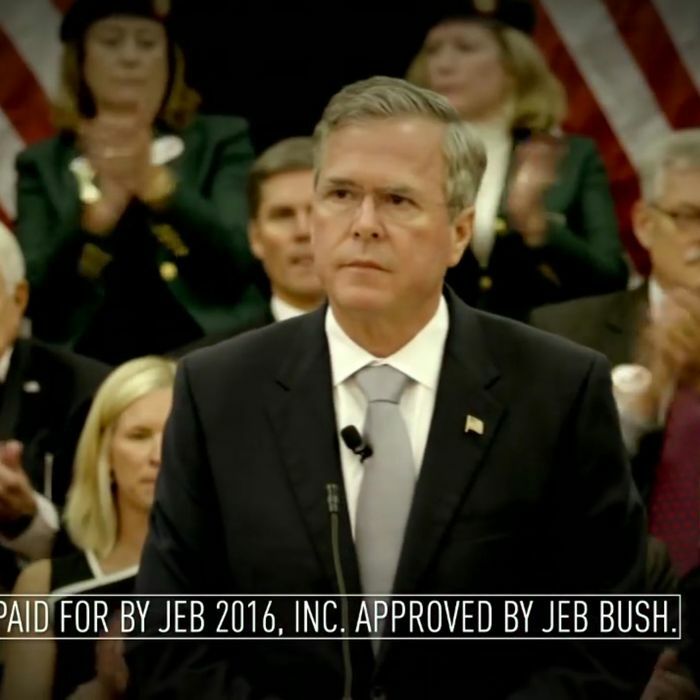 But Bush isn’t the only Republican candidate whose ad spending doesn’t seem to be working. Two outside groups have spent $8 million on ads — nearly as much as the team backing Hillary Clinton — supporting John Kasich, who is tied for eighth at 2.5 percent in the RCP national average of polls. The rival with whom Kasich is tied, Chris Christie, has totaled $6.4 million in ad spending, mostly from a super-pac. Meanwhile, the candidate currently trouncing all these worthies in every poll in nearly every state, Donald Trump, has benefited from a grand total of $217,000 in TV ads. In presidential-campaign terms, that’s enough to buy a fast-food meal deal, but not enough to supersize it. The one big spender on TV ads who’s in double digits in the polls is Marco Rubio, with $10.6 million in spending, most of it from a dark-money 501(c)(4) organization. Even with his money included, the topsy-turvy nature of this invisible primary is best illustrated by comparing the ad spending for the Big Four candidates dominating the contest, and everybody else. In today’s new Quinnipiac poll, Trump, Rubio, Carson and Cruz together account for 76 percent of respondents. Together they’ve spent a little over $13 million on TV ads (most of it by Rubio). The rest of the field, which together has spent nearly $37 million on TV ads, has a collective 15 percent of the vote. You may still be able to find pundits who will dismiss everything that’s happened up until now as meaningless (tell that to Scott Walker and Bobby Jindal! ), and confidently predict big TV ad money will determine the nomination by and by. But the desultory impact of the very real money spent so far on very real campaign ads suggests the only “shock and awe” in sight is in the minds of donors who realize they are pouring a lot of money down a lot of ratholes.